The city of Sao Paulo has a large Italian population and is proud of its Italian restaurants. So it came as a shock when some of them announced that any dish with a tomato base would be dropped from the menu. This startling change to such a traditional offering came after tomato prices soared over the past 12 months in Brazil, at one point recording an increase of around 150%, according to the IBGE, Brazil's statistics agency. And the impact went far beyond restaurant tables as pressure grew on the government to curb rising inflation, an issue that is deeply sensitive in South America's largest country. No-one is saying there has been a return to the bad old days of 1990's hyper-inflation when at one point the rate topped more than 2,000%. But at the weekend, increasing prices were again front page news in some of Brazil's leading magazines. 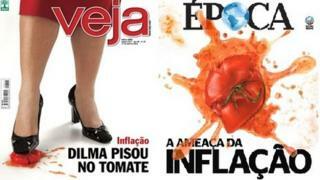 In one, the foot of Brazil's President Dilma Rousseff was portrayed as squashing - what else, but a tomato. Sao Paulo's famous Nello's restaurant was the first to grab headlines with the decision to drop tomatoes from the menu, a move announced on its Facebook page. "We did this to raise people's awareness," manager Augusto Mello told the BBC. "We've always paid around two reais (66p/$1) per kilo of fresh tomatoes. But prices have recently soared, and we were paying seven reais per kilo, which is too much, especially for a restaurant like ours, that needs to buy one tonne every month,"
The rise can be explained by a combination of factors, analysts say. "Tomato prices are rising because of heavy rains, high fuel prices, superheated demand and, mostly important, a reduction in the area used for plantation," says Leonardo Machado, an analyst at the Federation of Agriculture and Livestock, in the mid-western state of Goias, a region which is the country's biggest producer of tomatoes. Food is where many Brazilian consumers are feeling the pressure most - making it a politically sensitive issue as well. "I've already cut tomatoes out of my vegetable-based diet, because I can't afford prices like these," says Mariliza Leitao, a retired music teacher. There have also been reports of people smuggling tomatoes from neighbouring countries, such as Argentina and Paraguay, where the staple costs less. But, apart from seasonal factors, experts say it reflects that the rate of inflation is edging up in Brazil. In March, the rate, which when measured over a 12-month period, increased to 6.59%. While lower than that of some emerging economies, it is still above the government's target of around 4.5%. "Prices are high because of many reasons. On one side, there has been an increase in people's wages and the unemployment rate is at a record low," explains Alessandra Ribeiro, an economist at Tendencias, a private consultancy based in Sao Paulo. "Brazil's Central Bank has also been reducing interest rates, which stimulates consumption. On the other side, production and investments fell. "As a result, there's an imbalance between supply and demand, which tends to force prices up," she adds. On Wednesday, the central bank decided to raise interest rates to try to bring rising prices under control. It raised them to 7.5% from the record low of 7.25%. A decade ago, Brazil's rates were amongst the highest in the world, reaching 23.5% in 2003. "The rise in inflation has triggered alarm inside the government as Rousseff's voters are very sensitive to employment and price," says Ricardo Ismael, Professor of Political Science at the Catholic University of Rio de Janeiro. "Any change could compromise her chances of re-election next year". But in her fight against tomato prices, Ms Rousseff is not alone. She has been backed by her predecessor Luiz Inacio Lula da Silva, who remains very popular among millions of Brazil's poorest citizens. "A very experienced woman like Dilma won't allow a little tomato to break an economy and a country whose people have learned to live with controlled inflation," Lula declared during a recent event of the ruling Workers' Party. And it seems that many Brazilians have responded with humour to the rise in tomato prices. Facebook pages have popped up for Brazilians to vent their feelings about what has become a luxury item for many. On one page called Tomate caro or Expensive Tomato, cartoons and photo montages poke fun at the fruit. "I don't want to be rich, just to raise a tomato plantation", reads one caption. It is a joke which the government must hope, like the tomato itself, will have a short shelf life.